Some of the following text, that which is in italics, was extracted from the Paterson Group International booklet CAT978, dated Autumn 1998. Other parts of the story have come to me from Christine Dowdeswell, wife of Donald's nephew, Ian. Christine says how she feels fortunate to have known Donald and how his accidental death in 1975 (read below) was a tragic loss to the family. "1998 is (was) the 50th anniversary of the founding of Paterson, the company that invented the developing tank spiral as we know it today and helped to bring home processing within reach of the masses. 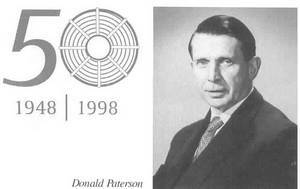 In those 50 years Paterson have gone on to produce an estimated 7 MILLION spirals and pioneered a large number of other darkroom products. And, like all great companies, it all started with one man - and a chance encounter." The following information has been provided to me by Christine Dowdeswell, the niece (by marriage) of Donald Paterson. In the 1940s Donald Paterson was a very busy man. He held professional qualifications as a Dental Surgeon and Lawyer (Donald's father was also a Lawyer). In his "spare" time Donald was a keen photographer, gaining an FRPS and regularly went on photo' safaris in Kenya. Some years after Roland's death, Sheila married a gentleman from Rhodesia named Bob Evans. Sheila died in Indianapolis in March 2008. "It was whilst on safari that Donald photographed a snake slowly swallowing a rabbit that it had caught and marvelled at the way the snake's backward facing fangs prevented the squirming prey escaping. That evening while recalling the encounter he realised the concept could be used to make a self loading film spiral, with the "fangs" gripping the film. Some months later he showed his design to photographic distributors R. F Hunter Ltd in London and they immediately ordered 500 reels. The rest, as they say, is history and the seeds of the Paterson company were sown. Late in 1948 Donald patented the spiral and 50 years on, the only major design change is that the "fangs" have been replaced by stainless steel ball-bearings." Sadly Donald Paterson died in 1975 while attempting to save a young boy from drowning. The Times for Monday 4th August 1975 carried a 'News in Brief' article entitled "Two Die in Loch. Emmanuel Williams, aged 14, of Hilde Court, Hackney, London, and Mr Donald Paterson aged 62 of Rivermead Court, Fulham, drowned in Loch Vaa, Inverness-shire (Loch Vaa is a small 1/3mile diameter loch about 3miles north of Aviemore) yesterday (Sunday August 3rd 1975). Mr Paterson was trying to rescue the boy." The Inverness Courier, for 5th August 1975, reported the incident under the heading "Double Drowning in Aviemore Loch". In common with other photographic equipment manufacturers, Paterson have had to reorganise several times over the years in order to survive. With its original core products being for the amateur darkroom, Paterson were especially susceptible to the change-over of the amateur black & white home darkroom hobbyist to using commercially produced colour prints. Add to this the general impact felt by the 'silver based' photographic industry to the advent of digital photography, it is commendable that Paterson have survived at all. Some of the changes that have occurred over the past 20 years can be read here, on a page dealing with the UK home colour chemistry manufacturers, Photo Technology Ltd.